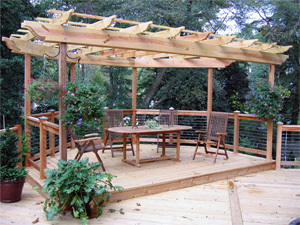 Mid Atlantic Deck and Fence receives allot of questions as to why pressure treated southern yellow pine is so susceptible to warping, cracking, twisting, and checking. Many customers believe that the warranty that is offered by the manufacturers of pressure treated pine covers these issues, but in reality they DO NOT. Most manufactures of pressure treated pine only cover rot and termite infestation for most residential applications. It is always a good idea to ask the lumberyard or your contractor that you are doing business with, to see a copy of the manufactures pressure treated warranty so you know what is covered and what is not. Here we go, it sounds complicated but I think you will find it quite interesting. Wood cells contain two kinds of water; free water found within the hollow space in the cell center and bound water found within the cell walls. When wood dries from green (freshly sawn) down to 21% (fiber saturation point). The loss of moisture comes from the loss of free water within the cells cavity. There will be little or no change in shape of the wood cell during this drying period because the cell walls are not drying. When the fiber saturation point is reached, all of the free water is gone and the wood then begins to give up the moisture within the cell wall. As the cell wall begins to give up moisture the fibers begin to shrink. This shrinking will continue until equilibrium moisture content is reached. This is generally caused by hot and dry weather conditions. To put this in simpler terms, the faster the moisture content moves in and out of the lumber the more the lumber will change it’s original shape, it is NOT a defect, it is just the nature of the species of lumber you are dealing with as it goes through it’s natural drying process. Generally speaking, the average moisture content of the atmosphere near the earth ranges from 12% to 15%. Again, this is average moisture over time. During periods of extensive heat, with little or no rain, the outside average moisture may go as low as 8% to 10%. This condition would be similar to that of the inside environment of a house with forced air heat. This is why a lot of times when you see the trim in your house especially in the winter separate, or in the summer your interior doors may stick, due to the humidity levels changing in your home. Thus the reason allot of homeowners have humidifiers installed in their homes to help balance out the homes moisture content. Up to this point; we have been talking about lumber as if the wood cells and the fibers within are all the same. There is also another variable that must be recognized, that of heartwood to sapwood. Typically speaking, heartwood is much more dense. This means it has more fiber in the cell walls than the open cavity within the center on the cell. The heartwood therefore generally has less moisture than the sapwood and will shrink less when drying. Sapwood tends to be less dense or have more open space within the center of the cell therefore, making it less strong and less stable allowing more dimensional shrinking. Also sapwood tends to dry at a faster rate than denser heartwood. Given these few facts; we can see why pressure treated pine has a tendency to move as it dries. At best, and in a perfect situation, lumber without restraint during drying will warp, crack, twist and bow. If we throw in other variables such as uneven drying on one surface caused by the sun etc. you have an even greater chance of movement. When lumber dries faster on one surface the other wood cells on the opposing sides are shrinking at different rates. The stresses set up during periods of extreme unequal drying are the main causes of dimensional changes of the lumber.